Home » Law Life » Is Your Fear of Commitment Holding You Back? Summary: Learn more about why you should overcome your fear of commitment in this article. Having a fear of commitment is often joked about among friends, and is a constant theme in romantic comedies and sitcoms, but did you know that it can affect much more than your romantic life? One great example of recognizing an overall fear of commitment came from Connie Chapman’s podcast, Awaken Radio. In the episode, she shares how she had been practicing yoga for 15 years, but never once committed to a studio membership. She could have saved a considerable amount of money by getting a membership, but never could fully commit and felt resistance whenever the topic came up. Why? Because when we aren’t committed to something, then we’re allowed to make excuses. We’re allowed to listen to our emotions and back out if we don’t feel like doing it anymore. 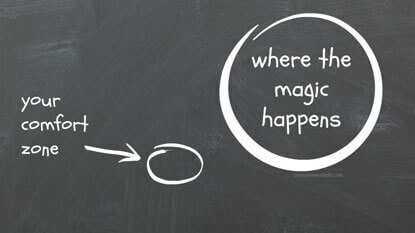 This is our comfort zone – where we aren’t committed to anything and can do whatever we feel like in the moment. The problem with not committing or getting out of our comfort zones is that we’re living a mediocre life. We’re just “dabbling” in different things, but never getting the full benefit and personal growth we could from fully committing and being challenged when things get hard. But when you really commit to doing something, then you’re forced to rise to the challenge and you become better because of that challenge. Do you have a hobby or side business that never seems to be growing? Do you notice that you just write when you feel like it? Or go on a bike ride when you’re in the mood? Do you go to networking events only when you’re excited about them? If you only do things based on your comfort zone and don’t really commit and go after them no matter what, then you’ll never achieve what you’re truly capable of achieving. Commit to something for yourself – tell others, sign up for something, make someone hold you accountable. Yes, you will feel resistance and fear, but when you get through the hard parts, the rewards will greatly outweigh the struggles you went through to get there.